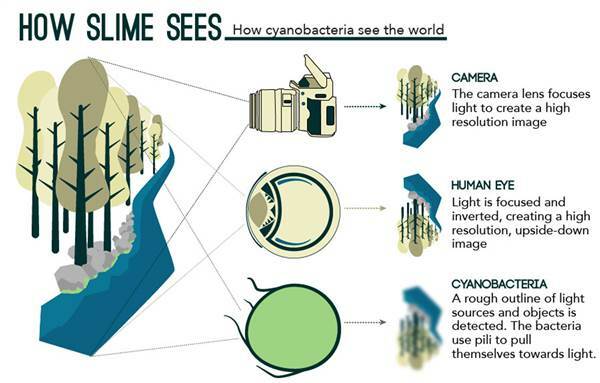 According to a new study, bacteria can actually see by using themselves as camera lenses to focus light. In this respect, they go beyond just seeing—they sense where light is. “The idea that bacteria can see their world in basically the same way that we do is pretty exciting,” said Conrad Mullineaux of the University of Freiburg in Germany and Queen Mary University of London. While it is widely known that bacteria can move towards or away from light, and they can photosynthesize light similar to how plants do, scientists didn’t understand exactly how bacteria registered light. “The physical principles for the sensing of light by bacteria and the far more complex vision in animals are similar, but the biological structures are different,”said Annegret Wilde of the University of Freiburg in Germany. The experiment was done on bacteria at a microscopic level, with scientists shining lasers at the bacteria to determine how sensitive they are to light. Results of the study revealing the process by which bacteria detect light were published in the journal eLife. According to their calculations, the bacteria can focus on the light in a way that is similar to the human eye, but the image would be significantly blurrier. This basically means that bacteria are, in fact, optical objects; however, no one noticed it prior to this experiment, despite the fact that scientists have been studying bacteria for the last 340 years.